A high quality 2m plug to socket TV aerial cable by Prosignal. High quality OFC coaxial cable. Metal body connectors. Gold plated contacts. Male plug one end of cable, female socket on other. Length 2 metre. 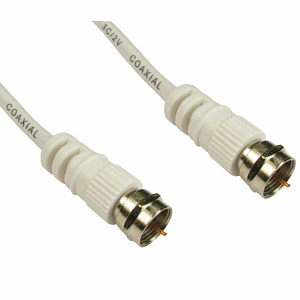 High Performance 10m Plug to Socket TV Aerial Lead by Profigold. 24k gold plated contacts and double shielded coax cable. Pearl chrome metal connectors with metal inner case. Interference Absorption Technology (IAT) together with multiple shielding gives maximum protection against Radio (RFI) and Electromagnetic (EMI) interference. 99.9996% oxygen free copper conductors. 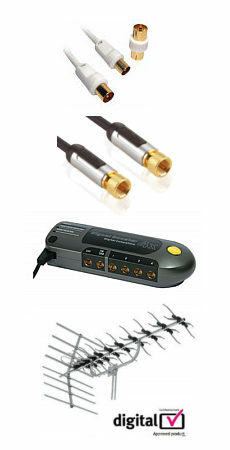 Ideal for TV aerial connections and TV aerial extensions. Length 10 metre.